Mass tourism can be roughly defined as thousands of people going to the same destination, often at the same time of the year, and often arriving in large, consecutive human waves. Examples of these human waves of tourism include, but are not limited to those times when enormous cruise ships dock and disembark or when weekly turnover occurs at area wide lodging and vacation rentals. 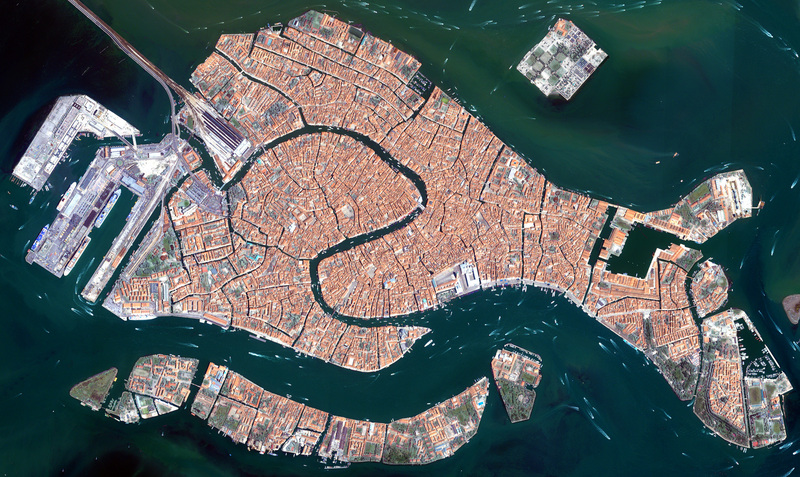 Similar accounts of Venice’s plight in the media have estimated that the city’s historic core could actually be void of any and all actual Venetians (long-term or full-time residents) by the year 2030! What has led to this potential calamity in Venice and some of the world’s foremost travel destination cities? In short, mass tourism. 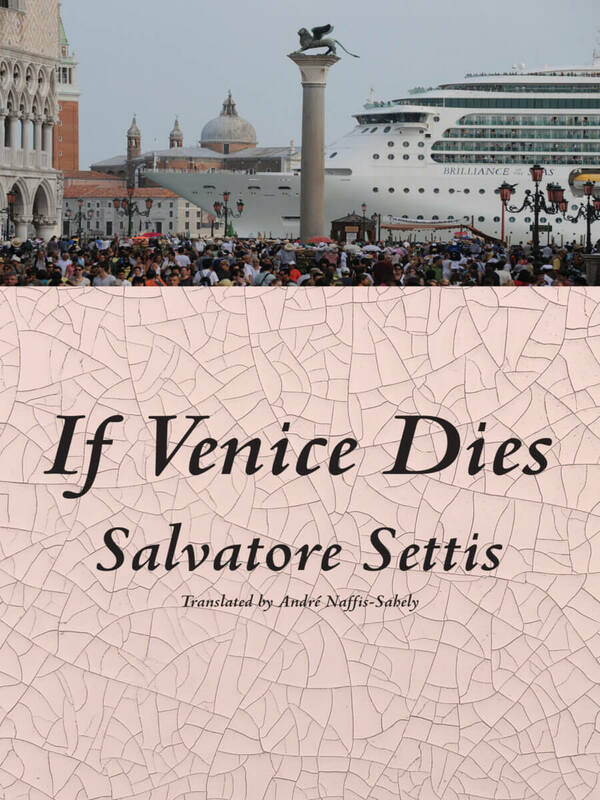 Based on data presented in Mr. Settis’ book, “tourists outnumber Venetians 140 to 1.” (page 10 – bold emphasis added) I refer to this problem of mass tourism altering a city’s very being as “The Venice Effect.” Essentially, it is a problem of loving a place (or city) too much. Venice is not alone in this perilous situation, as Barcelona, Spain; Dubrovnik, Croatia; Lisbon, Portugal; Phuket, Thailand and many other destination cities of varying sizes being literally crushed by repeated waves of tourists. I have observed it living here in Traverse City as each successive wave of weekly rentals arrive during the summer and when 500,000 visitors converge on the city during the National Cherry Festival in July, as well as in Bar Harbor (population 5,235) and Ketchikan (population 13,477) when cruise ships packed full of excited tourists arrive in these small port cities. In fact, before my wife and I traveled to Bar Harbor in August 2016, we were advised to stay out of the downtown area on the days that cruise ships were in town to avoid the crowds. As highlighted, all of these factors combine to drive up property values/rents beyond what is affordable to year-round residents, thus pushing locals from the historic city center and into the suburbs or elsewhere. In the worse case scenarios, what’s left behind could be best described as a pseudo-fake, Disney Main Street theme park, facsimile of its former self. 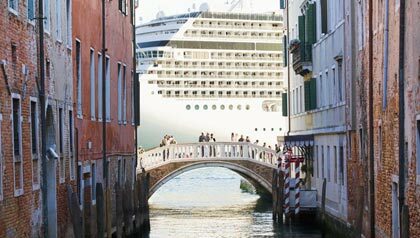 In other words, waves of cruise-ship crowds and landlubbing vacationers wandering the historic streets (or canals), all the while being blitzed with a monotonous array of tourist traps, high prices, and kitschy schlock. Walt would be quite proud. The rest of us…not so much. 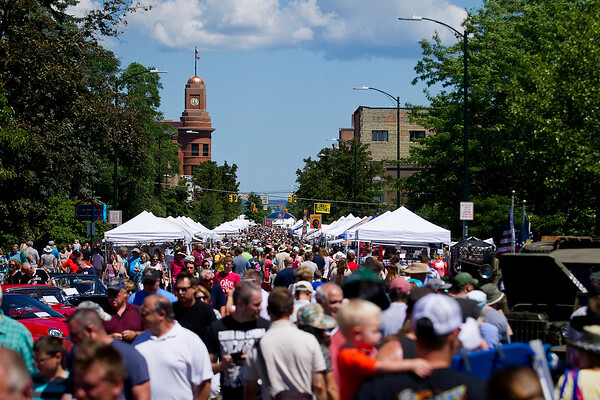 Source: Record-Eagle/Jan-Michael Stump – Crowds pack Union Street for Sunday’s National Cherry Festival Old Town Classic Car Show and Arts and Crafts Fair in Traverse City. For a city to be true to itself and therefore be a truthful representation of what tourists want to see, destination cities must remain culturally vibrant, economically active and diverse, and faithfully honor those virtues that made the city unique in the first place. That does not mean the city should be shackled in some sort of protracted stasis, like a museum piece put on display in an enormous showcase. The destination city must be allowed to renew, reinvent, and regenerate itself as necessary–otherwise it will gradually wither away. Develop clear goals and objective within the master plan which promote a vibrant, diverse, and healthy community. Advocate for practicing the ten principles of responsible tourism. Establish and support a downtown development authority. Protect what is truly special, but do not overly restrict innovation in the process. Regulate short-term rentals and establish a registration or licensing process. Enforce your zoning code if it prohibits short-term rentals. Otherwise, you must accept the fact that there will be consequences. Limit cruise dockings and/or the size of ships allowed to berth. Impose minimum affordable or workforce housing quotas as a condition in special land use permits. Increase housing opportunities by allowing tiny houses, bungalow courts, accessory dwelling units, and cottage clusters. Incentivize local ownership of businesses and property. Work with non-profits to acquire properties and/or protect local ownership. Promote buy or shop local programs. Seek grants and other opportunities to enhance those attributes which make the city special. Continually assess the situation and adjust goals, rules, ordinances, and incentives as is deemed necessary. Continually think and plan outside the box. Being a tourist destination city can be a positive attribute in many instances, as vacationers help fuel the local economy and job market. It can also be enjoyable for residents, as we are afforded more culture, entertainment, and/or recreation opportunities than residents of other cities of a comparable size. However, too much of a good thing can be detrimental. For popular destination cities, too much of a good thing can literally be a matter of civic life and death. As a result, it is imperative to find that happy medium between the needs of the year-round residents and of the shorter-term visitors. Not doing so can and will imperial the very essence of the city, as has been demonstrated in Venice. Hopefully, Venice and the other destination cities facing the problems associated with mass tourism will find a suitable equilibrium before it is too late. Few things could be more sad than seeing an unique and lovely city lose its heart and soul right before your eyes, especially when it was preventable. Namaste! In addition to the aforementioned book, If Venice Dies, here are some additional suggested readings on this subject. This entry was posted in adaptive reuse, air travel, art, aviation, book reviews, books, branding, cities, civics, civility, commerce, consumerism, culture, demographics, density, diversity, downtown, economic development, entertainment, environment, gentrification, geography, globalization, historic preservation, history, Housing, humanity, infrastructure, land use, placemaking, planning, recreation, social equity, spatial design, sprawl, Statistics, sustainability, tourism, traffic, transportation, Travel, urban planning, walking, zoning and tagged Bar Harbor, Barcelona, cruise ships, Dubrovnik, Italy, Ketchikan, Lisbon, mass tourism, Phuket, travel, Traverse City, Venice. Bookmark the permalink. This is a variation on a larger theme; larger population focused on limited resources. Another good example would be NBA salaries and sports ticket prices. These are examples of large increases in demand chasing arbitrarily limited resources. There is not alternative in this scenario other than very large increases in salaries and prices that are totally disconnected from logic to the regular consumer. This is also a function of the continuing distribution of wealth to smaller proportions of the population. Although this wealth is concentrated in a small percentage the number of people represented by that % continues to increase.